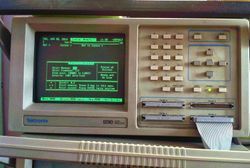 The Tektronix 1230 is a logic analyzer chassis that supports 16 to 64 channels, 100 MHz asynchronous, 25 MHz synchronous. It was introduced in 1989, a year after the 1225 and 1220. The 1230 is very similar to the Tektronix 1225 and 1220, the difference being board layout and the number of channels. Four user-installable option boards were available − parallel printer interface, RS-232 interface, GPIB interface and on-line notes in foreign languages. Tektronix also had a software package S43R101 that would run on IBM PC compatible machines. It used the RS-232 port to control the analyzer. A digitizing scope card could be installed with a 100 MS/s resolution on two channels 1230DSM. It was also available as a all in one package (1230D). There was another variant, the 1230B. The only difference was that it had a self-contained internal rechargeable battery. See the Microprocessor support table for microprocessor disassembly configuration options. An "Easter egg" can be activated in the 1230 by pressing the STOP button when the welcome screen shows during power-up. A bar with the programmers' names will display near the bottom of the screen. This page was last edited on 6 April 2019, at 13:45.